A $75,000 city-funded study analyzed spending by short-term rental visitors and the jobs and wages tied to those properties. 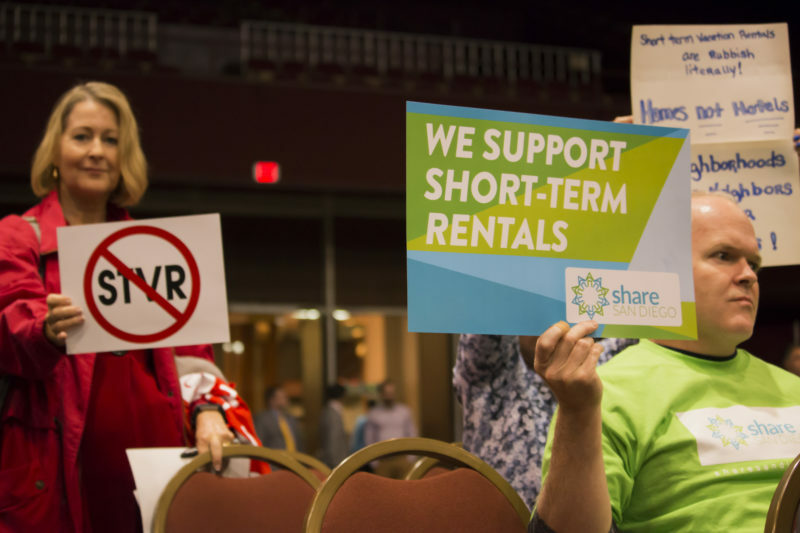 The study didn’t delve into one of the most hotly contested charges raised in the vacation rental debate: whether short-term rentals remove homes from the housing stock. The city of San Diego paid $75,000 for a study analyzing the link between short-term vacation rentals and affordable housing needs, but the study didn’t end up delving into the most hotly contested charge from opponents — that vacation rentals remove homes from the housing stock and lead to price increases. Instead, the study narrowly focuses on tourism spending and jobs created by vacation rentals in order to justify the mayor’s proposed affordable-housing impact fee for vacation rental stays. After years of debate over short-term rentals and whether they may be affecting San Diego’s housing market, Mayor Kevin Faulconer earlier this month unveiled his proposal to regulate vacation rentals and charge a $2.73 nightly fee to help fund affordable housing developments. The fee, which would be automatically assessed by vacation rental operators like Airbnb, is expected to pull in $2.1 million a year to support affordable housing developments. For years, opponents of short-term vacation rentals have insisted that short-term vacation rentals remove permanent housing from the market, but there’s been a dearth of data to back them up. The city sought to get a handle on the nexus between affordable housing needs and vacation rentals after City Councilman David Alvarez refused to support a past regulatory compromise if the city couldn’t immediately begin charging the affordable housing fee. City officials said a study would be needed first. What resulted is a $75,000 study from consultant Keyser Marston Associates that analyzed spending by short-term rental visitors staying in different neighborhoods and the jobs and wages tied to those properties, rather than the impacts of rentals on the housing market. The study, which relied on vacation rental prototypes in seven city neighborhoods, found that workers such as cleaners and gardeners who work at vacation rentals in the city produce a need for housing for low-income workers that could support fees as high as $19.37 a night in La Jolla and as little as $2.73 for a moderately priced home-sharing operation. Elyse Lowe, Faulconer’s director of land use and economic development policy, said the city chose to go with the lowest $2.73 nightly fee for legal reasons. Lowe acknowledged the city initially sought a deeper dive into vacation rentals’ impact on the city’s housing stock after Alvarez’s request. Lowe said city officials had asked consultant Keyser Marston to analyze the number of homes converted to short-term rentals and thus no longer available to San Diegans, but the consultant advised against it. “Keyser Martson advised us that is not the appropriate way to perform type of study requested by the council,” Lowe said. Economist Alan Nevin, who produced a 2017 study funded by vacation rental operator HomeAway, dismissed the Keyser Marston report after reviewing it at Voice of San Diego’s request. Nevin’s report, initially released last October, had also analyzed visitor spending and jobs tied to vacation rentals. He believed the city should have instead sampled households in city ZIP codes with the greatest concentrations of rentals, and analyzed housing prices in those neighborhoods. Alan Gin, a University of San Diego economist who has questioned how vacation rentals are impacting the housing market, also reviewed the study at VOSD’s request. Gin said the methodology for calculating the fee seemed sound but said he’d like to see the city further investigate how vacation rentals impact the housing market. “The study just had a very narrow purpose, and that was to determine how much this fee should be,” Gin said. Experts have dug in elsewhere. A 2017 review by the National Bureau of Economic Research and two California-based academics concluded that a 1 percent spike in Airbnb listings nationwide led to slight increases in rents and housing prices in areas with a median rate of owner-occupied homes, while a 2016 University of Massachusetts Boston study found increases in Airbnb listings led to a .4 percent increase in rents in Boston-area neighborhoods. Lowe said the city is also hoping for more information and hopes to learn more about its vacation-rental market once regulations are in place. The City Council will consider Faulconer’s proposed vacation-rental rules on July 16. There are no immediate plans to further examine how vacation rentals are impacting San Diego’s housing market.